How Qyk is spreading its reach Local Service Marketplace? Qyk was founded just nine months ago in October 2014 with a vision to build a hyper local solution for customers. Whether you are looking for wedding photographer or interior designers, pest control agents or music teacher, Qyk gives its users an easy way to get matched with quality service providers who are competent, affordable and available to finish the job. Qyk (qykapp.com) is a unique mobile platform which enables customers to hire trustworthy service providers and professionals near their area. This includes service providers other than ‘home services’. Why we choose Qyk as startup of the Week? Qyk is a mobile app serving the people with its unique features. The app enables customers to hire various service providers who are competent, affordable and according to the location nearby. The brand name in a very short span of time which is less than a year has gained its popularity over the social media platform Facebook that shows it has over 43,000 fans. Growing on its popularity, the service has increased from a single city to 3 metros currently and has plans to capture the market in other metros in coming months. As other startups, Qyk was also started with a personal experience. Deepak Singhal, the founder of Qyk while planning for his weddingwas looking for a wedding photographer over the internet. However, he succeeded in getting one but it was really a very difficult for him. In the own words of Deepak “I tried to find photographers online, but realized there was not enough information for me to make the decision. I ultimately spent around three weeks searching and finally found a good photographer”. And this was the whole fact that triggered the idea of Qyk; a one-stop shop for all the services that people would need and look for in daily usage. Deepak and Shobit were working together at Urban Touch. During that time, both were looking for opportunities to start their own venture. Sangharsh and Anubhav, who were mutual friends of Deepak and Shobit, would get together often after the office hours. After brain storming and discussions over the time, Qyk was established in October 2014. The founding team comprises alumnus of IIT Bombay and IIT Kharagpur – Deepak Singhal, Sangharsh Boudhh, Shobhit Singhal and Anubhav Sahoo who come with past working experience with companies like Ola, Inmobi, Practo and Deutsche Bank. The app asks users to specify his/her service requirements and it pushes aggregates competitive quotes from the most relevant service providers. It makes it easy to compare and save time and money. Once the customer gets on to the portal or app, they post a request of the service they need and their pin code. This request is then processed by answering a few relevant questions. The team in turn gets in touch with the relevant professionals as per the panel and gathers the quotations. The customer in turn is provided with three best quotations from which they can choose. Qyk on 14 March this year raised angel funding from a group of angel investors including early investors of Ola, Housing and Delhivery. Qyk seeks to serve as a one stop platform for availing a wide range of local services. 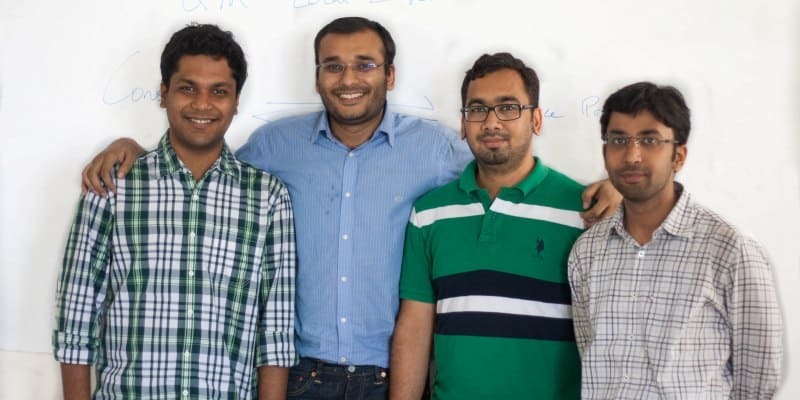 The funding round was led by Zishaan Hayath (co-founder of Toppr and Powai Lake Ventures), Abhishek Goyal (CEO and co-founder of Tracxn.com) and Sahil Barua (CEO and co-founder of Delhivery). The company has a brilliant team and the right skill set to make things happen. “We have grown from zero to over 100 requests per day in less than three months,” said Deepak Singhal. The team aims to reach 5000 requests per day across five cities within the next 12 months. The current revenue model is commission based. According to Deepak, Qyk’s secret sauce is their technology. He emphasize highly on the efficient algorithms to match service providers with customers saving everyone’s time and effort. The result of the tiredness effort of the founders and team is shown on the social media too. At present, the Facebook fan page has over 43K fans; Twitter has witnessed 136 followers and LinkedIn has over 2300 followers and the count is increasing for this newly started company.